We are all different. No two people have ever been created the same. That is because our God and Father absolutely loves variety! He is the ultimate Creator who has never made a duplicate of anything. Every leaf, every snowflake, every blade of grass... all one-of-a-kind originals! 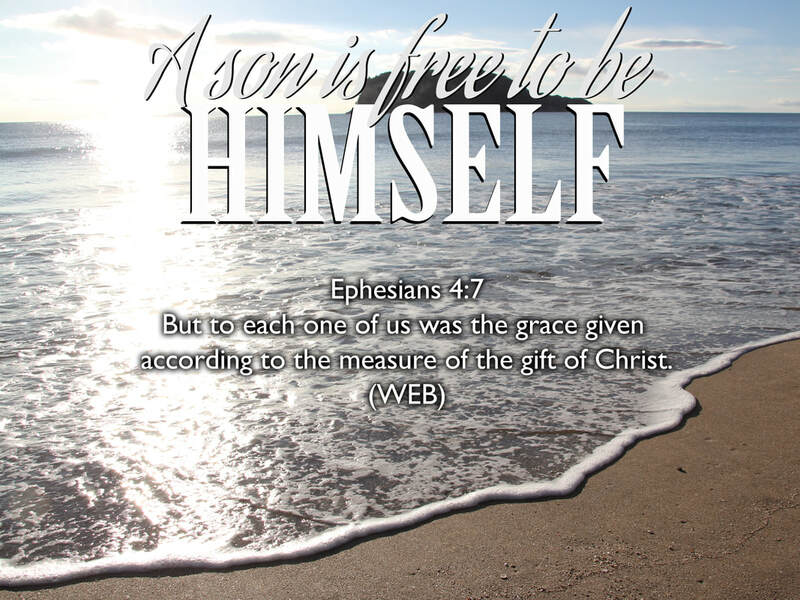 In this week's blog, I want to talk about how original each one of us are in our Father’s sight and how it is His desire for us to simply be who He created us to be. On the surface, it sounds simple enough. Just be yourself. That shouldn't be that hard to do? …Or is it? Perhaps when we were little, this might have been easier to do because little kids are simply who they are. They have no pretense. Just a beautiful innocence that has not yet been tainted by the adult world that surrounds them. But somewhere, somehow, even little children begin to learn that it is not always safe to be real. There is a saying that I am told comes from a Danish philosopher that says something like this... "Every person was born an original but the tragedy is that most of us die copies". I believe this quote touches on the epic battle that many people face to simply be themselves. In my former career as a newspaper advertising sales rep, I was oh too familiar with the media’s influence on society. Part of my job back then was to help advertisers create ads that would motivate people to buy their product or service. Usually the message the advertisers communicated was one that was very self serving. After all, all they wanted was to have customers buy what they were offering. Unfortunately, this has created a media culture where the average person is bombarded with hundreds (if not thousands) of media messages every day. These messages tell us what kind of car we should drive, what type of clothes we should wear, etc. in order to be part of the 'in crowd'. This continual assault on our soul has caused many people to try and be something they are not in order to find acceptance. The problem is, buying the right (fill in the blank) won’t make you more lovable than you are right now, yet that seems to be what the media would want us to believe. If the media’s influence is not bad enough, add the unrealistic expectations that come from friends, family, employers, teachers, etc. … and the pressure to be something we are not can at times be overwhelming! Even in church cultures, we may pay lip service to the fact that we are all unique members of the Body of Christ, but when the rubber hits the road, do we really give people permission to be themselves? Often for the sake of ‘unity’, we try to direct a whole bunch of unique sons and daughters into a very narrow funnel that we might call the church’s vision. While I am confident that most church leaders only have the best of intentions for their congregations, if they are not careful, they might communicate that they are looking for clones of themselves rather than living with the tension that a diverse group of people might create. If the main leaders have an evangelistic heart, they may want to raise up a church of evangelists. The same goes for the prophetic, teachers, pastors, worship, etc. Of course there is nothing wrong with casting a vision for people to rally around, but it is a little trickier to do while encouraging everyone to authentic in the process. A good friend of mine once told me that the anointing of God can only flow through the real me, and not the 'me' that I think that other people are expecting. I truly believe that the more we are convinced that God loves us just for who we are, the more we will become free to simply be who that person is. The more we can rest in the acceptance that is already ours, the more we will be able to trust our heart's desires (Philippians 2:13) and fulfill the unique destiny that our Father has for us. In 1 Corinthians 12, the Apostle Paul is very practical when he speaks about body life. The fingers need the hand, the eyes need the feet, etc. The human body is not complete without every unique member doing its job. Paul gave this analogy to illustrate that the Body of Christ is exactly the same. We all need each other to be unique in order to maintain a healthy body life. My prayer today is that each one of us would hear the Father say to us the same words that He said to Jesus at His baptism... "This is my Son, whom I love, in Him I am well pleased". I pray that the affirming words from a loving Father (who is pleased with the way He made us) would bring a security to our hearts that would give us the courage to simply be who He made us to be! May we all live out of the simplicity of just being authentic so that we can reflect the unique image of God that we were all created to reflect. If we don't, we will rob those around us of seeing the unique reflection of God that we were designed to be..After all, our Father does not make copies!